Butch Cassidy and the Sundance Kid were a part of our mythical heritage long before the movie starring Paul Newman and Robert Redford was released in 1969. Hollywood cast two of their biggest stars to play these charismatic outlaws. The facts about Cassidy are interesting enough, but the myths also say something about how the public perceived him. We do love our outlaws. We sometimes attribute altruistic characteristics to them that may fall miles short of the truth. Americans especially love rooting for the guy with nothing who is willing to stand up to the banks, the robber barons, and even the government. Butch’s real name was Robert Leroy Parker. 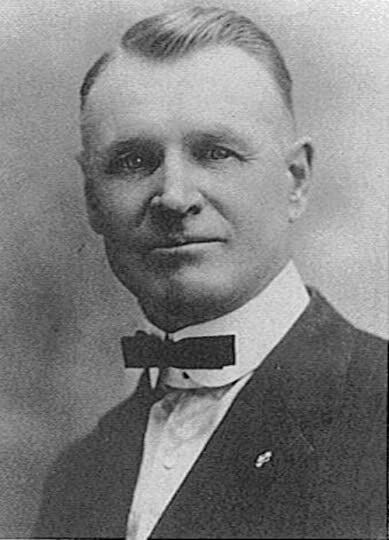 He was born in Beaver, Utah, in 1866 to a Mormon family. Life is not fair and sooner or later all of us feel the sharp sting of disappointment when we discover that justice is not always available to us. When the powers-that-be of the Mormon religion decided to move Parker’s father off his fertile land, it might have been the first inkling that Parker had that the deck was stacked against those who don’t deal the cards. He decided to take what he never had a chance to have. To protect his family he began using aliases, the most famous, of course, being Butch Cassidy. He started out rustling cattle, which in this time period was the most common way for a young man to get himself in trouble. It was too easy. There were too many loose cattle around, most unbranded. The victims were large ranchers, not exactly sympathetic figures. Still, Butch got caught and sent to jail for the first and last time. When he came up for parole, he demanded to see the governor and offered him a deal. If he granted his parole, he gave his word of honor that he wouldn’t rustle cattle in Wyoming anymore. The governor might have been amused at this audacious young man; certainly he was amused enough to grant him his wish. 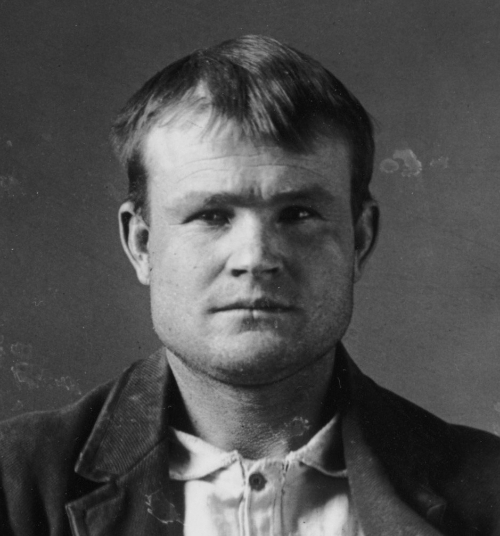 The Butch Cassidy mugshot from prison that was used on his wanted posters. Moments like this set Cassidy apart from other outlaws. He saw himself as on equal footing with those who had power, influence, and wealth. When he started robbing banks and trains, I can’t help but think that this was yet another way for him to even up the imbalance between what he didn’t have and what the rich were trying to hoard. After he had become a successful, famous train robber, he reached a point where he was tired of running and made an offer through his lawyer to the railroads to strike a deal for amnesty if he would quit holding up their trains. Unfortunately, a snow storm delayed the men who were supposed to meet with him, or Cassidy’s contribution to history might have been a footnote. After they didn’t show up, Cassidy was more determined than ever to make them pay. It was in Fort Worth, Texas, after several weeks of literally living in a whore house, drinking, and having a good time, that Butch and the Wild Bunch decided to have their picture taken. They were swimming in cash, and they perceived themselves as successful men who wore expensive clothes. They looked dapper The photo turned out so well that the photographer put a copy in the window of his shop. It was seen by the authorities, and suddenly those line drawn sketches on their wanted posters were replaced with real photographs. The skillet got too hot. It was time to hop out. 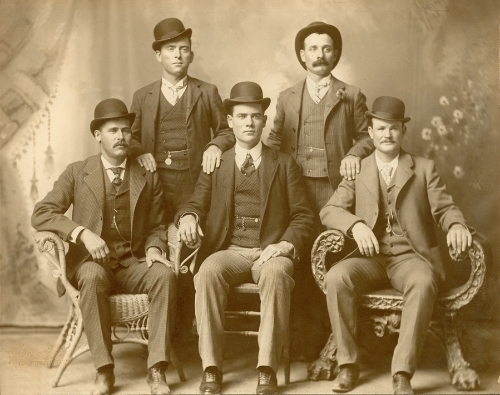 Front row left to right: Harry A. Longabaugh, alias the Sundance Kid, Ben Kilpatrick, alias the Tall Texan, Robert Leroy Parker, alias Butch Cassidy; Standing: Will Carver, alias News Carver, & Harvey Logan, alias Kid Curry; Fort Worth, Texas, 1900. 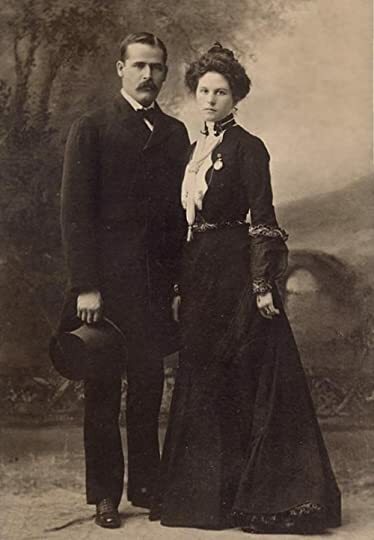 It was not uncommon to hear about outlaws escaping to Mexico, but what was unusual about Butch and Harry Longabaugh (Sundance Kid) was their decision to go to South America to start fresh. I’m sure there were other American outlaws who found their way down there, but it does speak to an audacious will to leave behind everything you know and go to a foreign country. The Pinkertons were not finished with Butch, nor was Charles Siringo, who had been hired to track him down. Butch and Sundance bought a ranch and tried to go straight, but soon the authorities circled, and there were fat banks in South America, too. In the picture, you can see that there is an expensive watch pinned to her dress. Cassidy bought that watch for her from Tiffany’s in NY, shortly before they travelled to South America. There is speculation that she may have been with Butch before she was with Longabaugh. Cassidy certainly was enamored with her, maybe even a bit jealous of her exclusivity with his pal Longabaugh, or maybe she wasn’t exclusive. Later, she returns to America with Longabaugh who had some health issues; he wanted to get looked at by American doctors. He left her in San Francisco, and this intriguing woman disappeared from history. Because we know nothing about her, we can make what we want of her. The famous scene at the end of the movie, where it is believed that Butch and Sundance met their end in San Vicente, Bolivia, was vastly different from the truth. The real story, or something close to the truth, was that they were surrounded by government troops, but before they could be caught or gunned down, Cassidy put a bullet in the head of the wounded Sundance and then shot himself. The movie had a much more dramatic ending that left this young viewer speechless. For weeks on end, the neighborhood kids and I played out that final scene over and over again. Needless to say, I’ve been acquainted with the mythology of Butch Cassidy and the Sundance Kid for a long time. Those names were made for newspaper headlines. 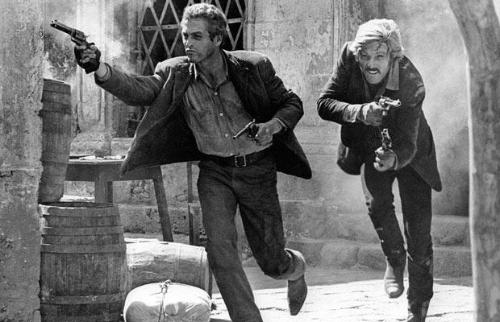 The question remains, were those two men Butch Cassidy and Harry Longabaugh? Richard Patterson has done a meticulous job of detailing everything that is known about Cassidy and even noting those stories that may venture into the area of might have happened. He debunks those stories that just don’t make sense with what is known to be true. As Butch became famous, robberies that could not have been perpetrated by him were attributed to him. If you are a member of a train crew that got robbed, isn’t it a much better story to say you were robbed by the Wild Bunch than Ted, Fred, and Puck? There is one great story about a bank that was robbed in Winnemucca, Nevada. There were rumors that the head cashier, George S. Nixon, was involved in that robbery and that Butch Cassidy had nothing to do with the robbery, despite a tentative identification from Nixon. Later when Nixon suddenly acquired wealth and established his own bank, those rumors started to sound like more than just rumors. Cassidy’s success at robbery might have created a piggyback crime opportunity for one head cashier, who in his own fashion stole from the rich to give to the poor...well...himself. The real question is, if Butch Cassidy died in San Vicente, then why did people keep reporting that they had seen him, talked to him, and not just friends, but family as well? One explanation is that people wanted to believe he’d escaped somehow. Like with rabid fans of Elvis, their need to believe outweighed the need for facts. Another problem might have to do with a guy by the name of William Phillips. He believed he was Butch Cassidy. Phillips actually traveled all over the West and seemed to enjoy those moments when he ran into someone connected to Cassidy. He had a passing resemblance. Anyone who goes back for a class reunion can testify to how significantly people change in appearance over time. There are things that don’t change, like the eyes, and when I look into the eyes of Phillips, I can actually believe he is Cassidy. To further complicate things, a team, in recent years, dug for the bodies that were buried at San Vicente and found bone fragments, but none of them matched the DNA of Cassidy or Longabaugh. Butch proves as difficult to catch in death as he was when he was alive. I can make myself believe either way. There is a part of me that really wants him to not be the guy at San Vicente, but there is also a part of me that believes it probably was. Just as I convince myself of this, I wake up in the middle of the night, puzzling over their inability to find the bodies. There is certainly enough doubt to keep speculations alive. It would be just like Butch Cassidy to have a good laugh about this golden opportunity to get his life back. He’d raise a glass to the poor bastards who got shot. He’d get a job, honest work, and ever so often he’d take a gander at the local bank and think about what it would take to liberate that money, hidden away from the people who need it most. The Pinkertons never did close his file.